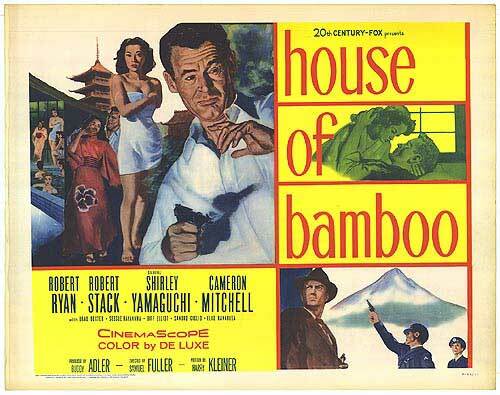 Sam Fuller’s 1955 movie House of Bamboo isn’t one of the greatest film noirs ever made but it’s in there for one of the most interesting, and despite its flaws I have found myself watching it over again. All the elements associated with Fuller’s style are on display, his ambiguous politics, break-neck story telling style and pulp sensibility, overlayed on this occasion with an oriental aesthete that veers between homage and cliché. Fuller throws the viewer straight into the action, a precision heist of a US supply train as it speeds through the Japanese countryside by a gang of men dressed in traditional peasant garb, the magnificent snow-covered peak of Mount Fuji in the background. They dispatch the crew without hesitation and unload the cargo into a waiting truck. Because the train was carrying small arms and ammunition and because one of the guards killed was a Sergeant in the United States military, the heat is on the local police to doing something.